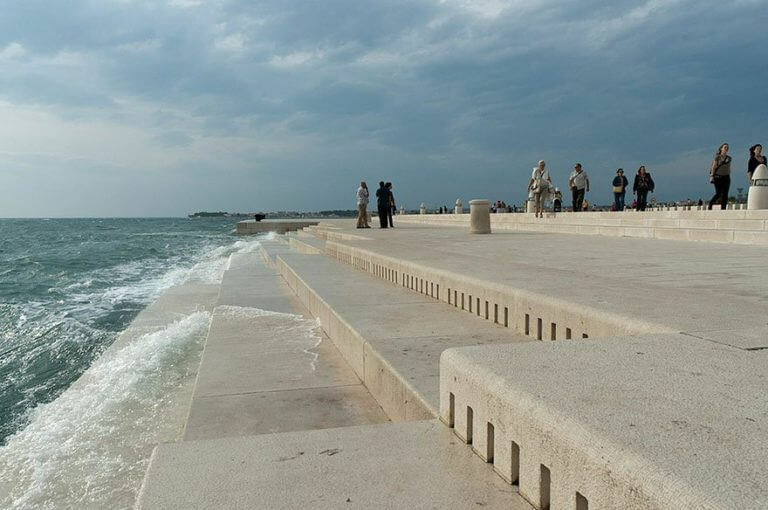 The Croatian architect Nikola Bašić created an impressive sea organ that translates the waves into a relaxing music. ‘MorsKe Orgulje’ which can be translated as ‘Sea Organ’, was designed by the architect in 2005. It is the undisputed star of the city of Zadar in Croatia. An incredible spectacle. This body channels 35 connecting tubes, each connected in turn to different music channels. Thus it obtained natural sounds. The notes are purely random and depend on how the waves crash against the organ. With this design, the Croatian architect won ex aequo the fourth edition of the European Prize for Urban Public Space. Inspired by a small Greek instrument name hydraulis , and the history of the creation of the Wave Organ in the city of San Francisco in 1986, the sea organ has 70 meters long, made entirely of concrete with steps in marble. Its 35 tubes accurately generate a different note caused by the movement of the waves and wind energy. Each tube passes through the structure and contacts the Adriatic Sea, while the top will see small holes, which together create a surprising and ideal to lose sight on the horizon, or melody simply a pleasure for our senses .